Inspired by the universal success of The Hangover trilogy (Todd Phillips’ films have amassed a whopping $1.4M at the worldwide box office), Last Vegas assembles a quarter of Hollywood’s most revered actors for a sleek R-rated comedy. Unfortunately, and in spite of its best intentions and heavyweight credentials, the film never quite lives up to its potential, resulting in a film that’s flat and uninspired. Years after their prime, three childhood friends – Paddy (Robert De Niro), Archie (Morgan Freeman) and Sam (Kevin Kline) – reunite to throw a bachelor party for their last remaining single friend Billy (Michael Douglas). Venturing to Las Vegas, the foursome strive to have one last blowout, but their plans are scuppered when old issues – which predominantly exist between Paddy and Billy – fail to stay under the surface. Directed by Jon Turteltaub, Last Vegas tries with all its might to be a charming, entertaining and risqué old school take on the successful stag night blow out film, yet fails to muster much momentum thanks to its sub-par script. It’s not that Dan Fogelman’s screenplay lacks potential, more that none of the interesting qualities, like the bad blood between Paddy and Billy, are fleshed out enough to warrant the audiences full investment. Instead, Fogelman and Turteltaub fall back on predictable narrative advancements and tired clichés akin to its Las Vegas setting in an attempt to tap into a market that’s proven its success rate over recent years instead of trying anything new. It’s a tact that makes even those brief moments in which the film veers off its blueprint and dares to stands upon its own two feet come across as artificial and try-hard. All of this not only comes at a price to the audiences faltering patience, but also to De Niro, Douglas, Kline and Freeman, the gifted actors going through the motions and delivering the cheesy dialogue in a bid to entertain. 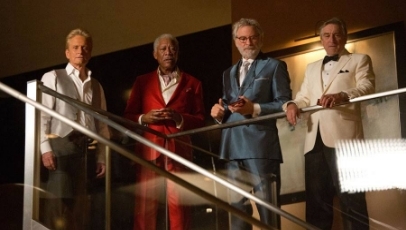 To their credit, they do their best to elevate the material (and merely do with their presence), but it’s simply not enough to save Last Vegas from being the easily foreseeable, tedious and very mildly funny comedy that it is. Reblogged this on Lemon Casting. Great review. Having recently suffered the disappointment of Stand Up Guys, I’m nervous about this! I don’t think I’ll be rushing to the cinema.